K. Padmanabha Rao affectionately and popularly known as K.P.Rao has been conferred with ‘Nadoja’ award by the Kannada University also known as Hampi University. For those who do not know K.P.Rao is the one who put Indian language on computers for the very first time. Other languages took the model from K.P. Rao and implemented. Thus K.P.Rao’s contribution was not just teaching Kannada to the commputers but showing the path for others to teach other Indian languages to computers and thus widening the scope of computer usage. When I met K.P. Rao for the first time in 2005 I was a complete computer illiterate, not even knowing how to switch on the computer. Today I am a semi-literate in computers. I say this because in this small write up I am not able to pen down the real contributions of the great man to the world of computers and Kannada. Yet, I am forced, by an inner force and affection, to write about this man who I refer to as “Mentor” and get referred to, by him, as “Tormentor.” So I am just trying to string a narrative which would give an idea of the man K.P. Rao as one of his students saw him as a teacher and as a human. I met K.P. Rao in the year 2005 when I joined the a media institute in Manipal where he was teaching. He had just joined the institute. My dad, who was K.P. Rao’s colleague, in an engineering college in Manipal, several years ago told me while joining the institute that one K.P. Rao would be teaching me and instructed me to go meet him. The Institute had mentorship arrangments those days. A faculty would have some students under her/him and would be their mentor for that academic year. The day the mentorship list was put on the notice board I was reminded of my dad’s instruction which I had almost forgotten. What reminded me of it was the fact that the list said K.P. Rao was my mentor. I went directly to meet K.P. Rao Sir, who spoke to me extremely affectionately. There was warmth in his company, which gave me an assurance that I could approach him anytime. He was accessible and available. One morning he casually asked me about my dad and I told him that my dad was going to the Himalayas in a couple of days with some of his friends. “Ask him to call me once before leaving. I will tell him where and all to go,” said K.P.Rao and said he could take me to the Himalayas then and there itself. Saying so he switched on his computer and opened google earth. It was no less to a wonder for a computer illiterate like me. He opened google earth and started telling me his favorite spots in Himalayas explaining the terrain the temperature etc etc of the various places. He went on to narrate stories of his Himalayan experiences. He said that he went to Himalayas every year. Till recent he did. Now for personal and health reasons he doesnt. But in his own words he gives a “proxy” attendance by motivating and sending some of his friends to the Himayalas every year. But that meeting with him, where he took me to the Himayalas, through google earth and through stories, showed me how knowledgeable and updated the man is about the real world and the virtual world. He has always come across as a man who knew both the worlds well. Knowledge is his purpose of life, I have always felt. Every time I meet him, now, he discusses some new idea some new thought that he is engaging with and takes out some book from his bag and starts speaking of it. Not always I understand what he says yet I listen to him for the enthusiasm and excitement with which he speaks makes me realize what passion is what learning is and creates a spark within me to be thirsty for knowledge. I felt like it was a lesson that I too had to learn: To become a student of life. What a thought. What a philosophy of life philosophy of learning. All said in a very casual manner. It was also an insight into what Sir is- a student of life. That is what I have to learn from him: being a student of life. K.P. Rao seem to have never seen himself as a teacher. He saw himself also as a student of life, always learning and always wanting to learn more. Even his students were his co-learners and not students for him. Recently when I moved to Pune he enquired me about one of his students who is now learning in the same institute as I am. 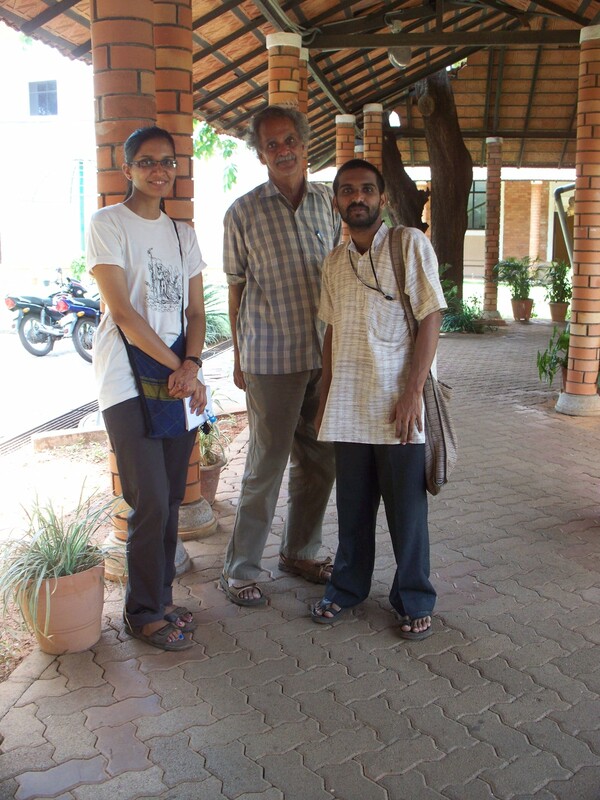 “Anadi is such a brilliant student,” he said and added, “I have learnt so many things from him. He is my teacher in many respects.” I was floored by these words. A teacher, who we all respect so much, was referring to one of his students as his “teacher.” This absence of ego this humility as a student of life, all have taught me so much that I can never explain in words. As he himself says there have been several giants from whom he has learnt, as a student of life. One such giant was D.D. Kosambi. In the monsoon of 2007 he organized a seminar on D.D. Kosambi to mark the birth centenary of D.D. Kosambi. He had single handedly organized the seminar, spending from his pocket entirely. It was a small but deep and meaningful seminar. He was content that day paying his respects to the man who he respects a lot and from whom he has learnt. After the seminar, that evening, he left the venue casually with no pride of having pulled off a seminar. Even after that day he never spoke of it as though he had organized something great. He did not own up to the success of the seminar. He never owned up anything it appears. After having developed the first Kannada software he did not patent it! 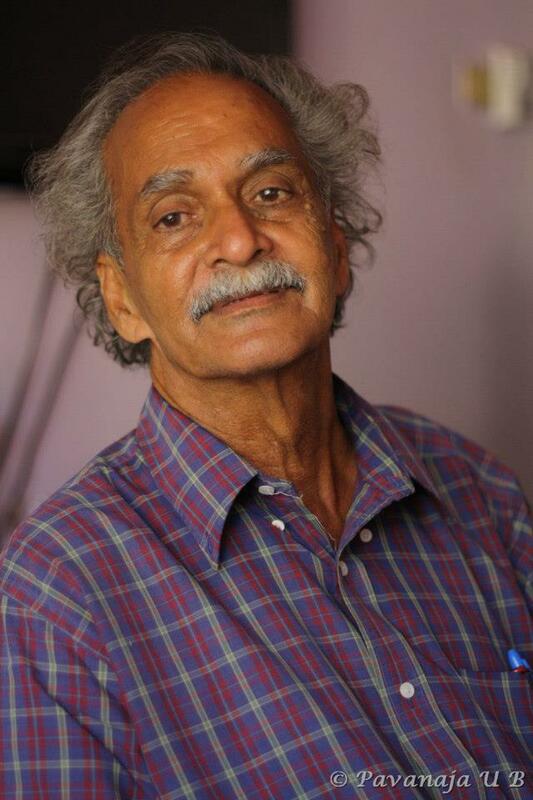 Even when one of his students- Srinidhi T.G.- proposed the idea of writing a book on him (which is to be released soon) he instructed that the book be titled ‘Kannada, Computer mattu (and) K.P.Rao ‘, placing his name after Kannada and Computer. He did not own the success of the students even when the students were attributing it to him. He did not own the success of a meaningful seminar. During my recent visit to Manipal he was asking me about my course in Pune and told me a story which he was working on with the master filmmaker G. Aravindan for a screenplay. Due to the passing away of Aravindan the story remained incomplete and the film never made. Narrating the half worked story he told me, “See if you can complete it. You need not give me any credits.” Completing it was more important for him. It din’t matter who completes it. It need not be him and he doesn’t want the credits for it too. While I was working on Master’s thesis I remember him getting me newspaper articles from various different sources to help me in my literature review. It was not just concern for him. It was also being a part of knowledge production. He would be with anyone if there is some knowledge churning happening there. He was majorly disappointed by the apathy of the students for knowledge. Many a times he expressed it to me. He would get angry and say how the disinterest of the students and their want for spoon feeding frustrates him. He once said, “They want to learn computers without knowing mathematics,” to which I said, “Sir don’t speak of mathematics to me. I hate that subject.” “Its not your mistake. It is the mistake of your teacher who taught you mathematics,” he said. I was more than happy to listen to it. As smile appeared on my face Sir went on to say, “Maths is taught in a very boring and dry manner. Say something like, two apple plus two apple is four apple. That is not the way to teach. The beauty of mathematics is that two of anything plus two of anything makes it four of something.” Wow! Like Wow! Never before that point of life had I found mathematics remotely beautiful. Sir and I have had many disagreements and quarrels and have been honest with each other in expressing it with each other. Many disagreements with regard to ideologies and issues have been there between us and we have discussed them in length. Though I have not agreed with him always his counterpoints have helped me learn something new and has widened my horizon. Today when I called to wish him he said, “I can see that you are more lively than ever these days. Our thoughts- he was referring to the case of Afzal Guru- might differ but we must be alive and lively. That is more important.” What did he mean by “being alive and lively is important,” I asked myself after speaking to him. I got an answer for myself when I recollected eight years of my association with him. His company has taught me a lot. Today I am happy, in fact more than happy, that my mentor’s contribution has been recognized in a big way. But he seemed casual about it when I spoke to him this evening. Possibly the award doesn’t matter much to him. I remember, in 2007 monsoon, when he got retired a farewell was organized for him. Couple of my friends and I went for the function because of our love and respect for Sir. To our surprise Sir himself had not come. When we called him he said, “I don’t require an official funeral,” and added, “Your love is enough to locate my place in the institute. Your love is the best recognition.” Even today he must be feeling the same. The love for him in the hearts of the people is enough to locate his place and his importance in the world of computers and the world of Kannada. People who know of his contribution have always recognized it and have located his place and importance and even people who do not know of his contribution, with their day to day use of Kannada in computers, have located his importance and recognized his contribution in their daily life. Now its time for some official recognition that’s all, which has come in the form of Nadoja Prashati. You are blessed to be associated with such a great human being. Lucky you! honestly, I did not know who that person was. I had read you mentioning about him several times, but knew very little about his contributions. Whenever I had opportunities to meet KPRao sir, or heard about him through my brother, who meets him regularly if he is in India, I have always felt, KPRao sir is at least 20-30 years ahead of us. What a personality! I am happy that at least now the government has “officially” recognized him, though it may not matter much for him. His life – being alive and lively is – is a great lesson for us. Thanks Samvartha for this post. Sahyadri College of Engg & Mgmt.